I thought I'd share a few of my favorite Mother's Day gift ideas here and there. This one rocks! When it comes to Mother's Day gifts, there's really nothing more special than TIME spent together, making memories. I love my momma so much I can't even tell you....she's one of my very best friends and I'm so glad I get to call her "mother." I also get to call her artist extraordinaire, because she is, fancy degree and paint-stained hands and all. Her artistic spirit is definitely something I inherited from her (though NOT her artistic talent!). Since my mom is an artist, she is constantly looking for new inspiration. Combining inspiration-seeking with memory-making? The perfect Mother's Day gift. So here's what I would give my mom if there was any way I could: A Sunday afternoon, blissfully spring-like and with the only purpose of the day being inspiration-gathering wherever the wind blows us. But since I don't live near my mother anymore (in fact I now live quite far away), I would send something more lasting than flowers. 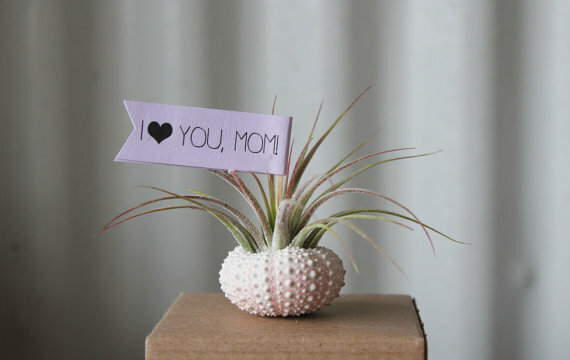 This air plant in a sea urchin is just perfect. It's beautiful, artistic, and it is a plant that lives on the moisture in the air. I don't know, it just sort of seems like a metaphor for motherhood. Sometimes it seems like moms live on the crumbs of our love, not necessarily fed with encouragement and words of praise by their children regularly. More likely screamed at, cried to, hung up on, all while ultimately loved and thoroughly adored. But they have to come to know that through osmosis sometimes--to find the "moisture in the air" and the love in the hurt feelings. We children are not always great at saying, "Hey mom, thanks! You're the best, and if you needed my kidney I'd probably totally give it to you (maybe. but definitely)." That's why we send air plants in sea urchins. Duh. LOVE YOU, MOM! You're the best! I love this! I don't have the greenest of thumbs though, and have a hard time keeping plants alive! My mother's garden, however, is gorgeous. Of course. When I was home in NH last weekend, I wanted to dig up some of her lily of the valley plants and bring them back to DC with me, but wasn't sure if I'd be allowed to fly with dug-up plants with roots attached!